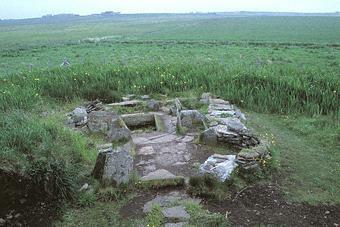 The best example of a Bronze Age cooking place (burnt mound) in Orkney. Here fish and large joints of meat were probably boiled in a central stone trough filled with water heated by hot stones dropped into it. The central trough measures 1.6m x 1m and is 0.6m deep. It is made of flat slabs, once sealed with clay to make it watertight. The site's floor is paved and there are some compartments made with upright slabs round the walls. The hearth is set in an alcove in the wall. The fuel was peat and the building was probably roofless. The site, situated at a short distance from Isbister chambered tomb, was discovered in 1972 by Mr Ronald Simison, a local farmer.